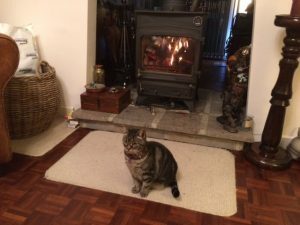 I recently swept the flue for this rather attractive large Double-Sided Woodwarm Stove. This stove was in a house in Wenvoe South Wales. I spent two days in South Wales doing some sweeping work for friends and family in and around Wenvoe; a sort of bus-man’s holiday if you will. It actually made a pleasant change to do sweeping work in a different area. 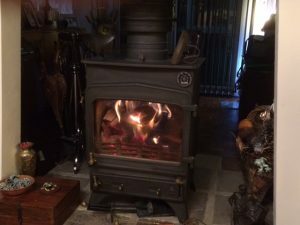 As you can see from the photos this stove burns very well, so much so it immediately attracted someone who wanted to warm themselves and have a sleep in front of a friendly fire. Wenvoe has been the center of thriving a farming community for centuries, and indeed a number of the properties a I swept for were large farm houses or converted barns. The village originally developed around the parish church of St. Mary, which can be traced back to the twelfth century with the adjacent locality now being a conservation area. 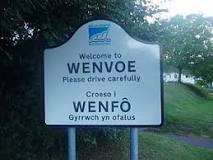 Wenvoe is recorded as having belonged to the De Sully, le Fleming and Malefaunt families in the later medieval periods. After being escheated to the crown the castle of Wenvoe belonged successively to the Thomas, Birt and Jenner families. Major development occurred in the 1770s but much of this was obliterated by a fire in 1910. Some medieval or earlier fortification is also known to have existed in the wooded hillside at Wrinstone.